The first BUSHY TALES comic strip book collection is finally here!! 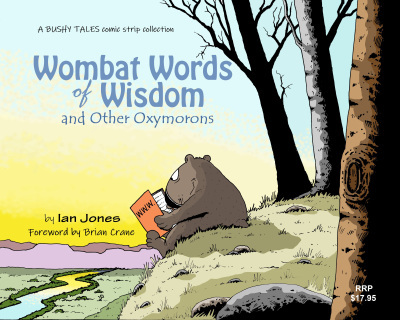 "WOMBAT WORDS OF WISDOM ​- And Other Oxymorons"
"...one of the freshest and funniest new comic strips I've seen in quite a while." This first book collection of BUSHY TALES comic strips is 96 pages of full-colour comic strip fun, featuring 27 Sunday strips and 135 daily strips, plus much more! We are incredibly honoured to have the Foreword to the book written by Brian Crane, the award-winning creator of the hugely popular PICKLES comic strip. Brian was awarded the highest honour in 2012 when he was named the National Cartoonists Society (USA) Reuben Award Winner as the Outstanding Cartoonist of the Year. And he loves BUSHY TALES!....Woohoo! "Wombat Words of Wisdom" is published in a handy size....210mmx180mm. It is a quality product, printed on 150gsm Satin Art paper inside, with 250gsm Satin Artboard covers with gloss celloglazing. This high-quality book is printed in full CMYK colour and is Perfect Bound. A splendid gift idea for yourself...and everyone you know and care about!